Gracefully weaves luscious textures and memorable melodies with the help of the formidable rhythm section of Dave Holland and Bob Moses. RECOMMENDED (The Legend of Tsumi). Great American Jazz Piano Competition, Gardony has been called a pianist worthy of praise within the highest pantheon of performers by Jazz Review, and a great pianist by Dave Brubeck. 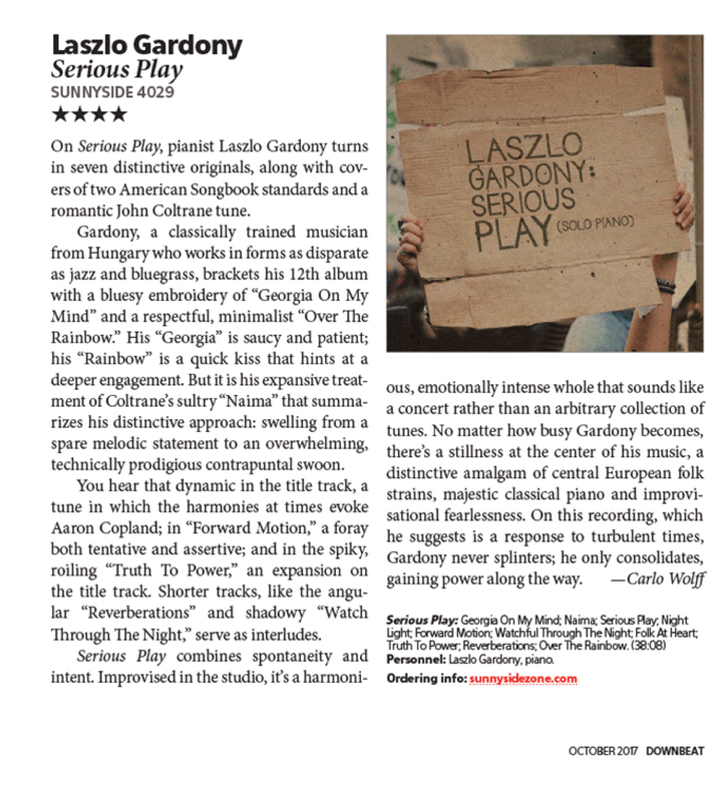 The Boston Globe named Gardony's latest solo piano recording, Serious Play one of the 10 Best Jazz Albums of 2017. His 2015 live sextet album, Life In Real Time was also on the 10 Best Jazz Albums of 2015 list of the Boston Globe. Bob Moses, Mick Goodrick, Yoron Israel, John Lockwood, Jamey Haddad, Bill Pierce, Don Braden and Stan Strickland among others. Gardony has been praised for his fluid pianism by The New York Times and has been featured with the Boston Pops, the Utah Symphony and The Smithsonian Institutes Beyond Category Traveling Duke Ellington Exhibit. Laszlo has been living in Boston for the past thirty-four years, where he is a Professor of Piano at Berklee College of Music. He continues to tour and record, attracting new fans and earning critical acclaim for his synthesis of many musical sources and for creating a joyous, powerful, insightful, and open spirited music. After graduating from the Bela Bartok Conservatory and the Science University of Budapest, he became one of Europe’s most sought after accompanists, and released his first albums as a leader. Possessing a powerful sense of swing, a strong feel for the blues and a firm command of post-bop vocabulary, he gained invaluable insight by sharing festival stages with acts like Art Blakey’s Jazz Messengers and Abdullah Ibrahim. After several years on the road, Gardony decided he needed to deepen his knowledge of jazz. A full scholarship to Berklee brought him to America in 1983, and a faculty position at the school upon graduation kept him stateside. He made his US recording debut with the acclaimed 1988 album The Secret (Antilles) featuring Czech bass great Miroslav Vitous and drummer Ian Froman, but it was his 1st place win the following year at the Great American Jazz Piano Competition that catapulted him into the national spotlight. His primary vehicle for the past decade has been his state-of-the-art trio with bassist John Lockwood and drummer Yoron Israel, an ensemble first documented on the 2003 Sunnyside release Ever Before Ever After. One of the finest working bands in jazz, the group performs and records regularly, exploring Gardony’s extensive book of original pieces as well as the occasional standard and jazz classics by the likes of Horace Silver and Billy Strayhorn. Gardony augmented the trio’s 2011 release, Signature Time (Sunnyside), with Stan Strickland on saxophone. His critically acclaimed 2013 solo piano album, Clarity followed, and in 2015 he released another critically acclaimed recording, a live sextet album, Life In Real Time (Sunnyside). It features Bill Pierce and Don Braden on saxophone, Stan Strickland (saxophone, bass clarinet), Yoron Israel (drums), John Lockwood (bass), and Gardony as pianist, composer and arranger. Laszlo Gardony is a New England Foundation for the Arts Touring Roster artist. NEFA provides up to 50% of musician fees when his trio is presented by a non-profit organization in five New England states (not in MA) . For more information please visit Laszlo Gardonys page at NEFAs CreativeGround.org .